Trip To Homer, Georgia - Dilapadated Capital of the World! Nothin' Like Shackin' in Georgia! Homer, GA is located in the north eastern part of the state. I went there to find an old cotton gin that I'm building for the Dixie Central Railroad, but I discovered a gold mine of old, run down buildings. Oh joy! 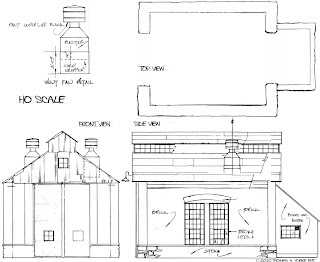 The O. S. Garrison Cotton Gin is amazing. It is a used car lot now, but much of the gin equipment is still in place. See photos of the Homer Gin! This unique structure greets you on the way into town. The town of Homer is very quaint and full of very old building, many of which have been partly preserved. The court house appears to be under remodeling and there is an old jail. Lots of rust and old structures to photograph including several gas stations, an old hotel or boarding house and a building that I cannot figure out what it is. Go visit when you can! I'm not sure why, but Homer has about six old gas stations in this one horse town. It may be because there is/was no railroad here that I can determine. This is very odd in a Southern cotton town. Maybe I just missed it. This station is two story, by the way! This restaurant is still in business I think. It has a lot of character. Norman Bates is finally coming home. What a creepy place! It is a hotel or boarding house of some kind and sits imposingly on the hill. I couldn't figure out what kind of building this is or was. It doesn't appear to be much until you walk around to the side. This wall screams to be modeled. The windows and boarded up doors are all different and the planking looks great! Of course, the Homer telephone pole is in the way. It followed me all day. There are two more gas stations, one very well preserved. This is a large, two story house or boarding house. I've got to learn more about the history in Banks county to figure out what they all are. Here is another great building that must have been a store with the house up above. The front porch structure is no more, but it is evident. This building has TONS of character. Old, weathered and dilapidated, it just yells to be modeled. I have photos on all sides. Here is a side door, maybe for unloading. Excellent! You can see the construction methods used where the boards have fallen off or rotted out. The renovated gas station comes with signs and a pump, but the "white" mortar is painted on and not original. Each one of the gas stations is VERY different and built at a different time, thus showing various contruction techniques. The shiny new roof blinded my camera in this shot, as it was daylight when I took the photo. Each side of this building is built with a different method! The other side is metal sheet, the back is clapboard. This here's the county Pokey, what you might call a jail. It is well preserved. This little shed was my most favorite of all buildings. It was some kind of tool shed or supply house as it had a very good floor at one time, so it wasn't for animals. When doing board by board construction you often want to see how the locals did it. This is an EXCELLENT example of how construction was done in Georgia in the early 1900's. That is why I think it held something important as it is VERY well crafted. Look at these supports! The floor had fallen out but it was evident that it was well made. Leave town, the Hillbilly Gallery is our parting shot. For those of you that might want to model one of these buildings, let me know. I've got another 150 photographs with details shots of most of them. Glad to loan them to you! I love model train clinics! Especially good ones! Mike Devaney who owns Trainmaster Models in Buford, GA invited the public to a clinic this afternoon called Weathering 101. Mike is a fantastic weathering artist and I've drooled over his models for years. So now he's going to show us how! The new clinic room is huge! It will seat 50 people easy and has digital projectors in the ceiling, work desks for each attendee and all the comforts you need for training. No other hobby shop that I know of has this. That's Iron Mike in the red shirt. We were supposed to be there for two hours. He threw us out after three hours! We had a blast. 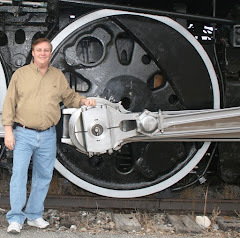 Mike covered weathering both large (G) and small (N) rail cars, structures, scenic items, track and other things. We began the program with a short slide presentation showing various weathered prototype objects such as rolling stock. Then we turned to the paints. It was handy doing this in the hobby shop because if we needed something we just went and got the material! Several weathering media were covered such as paints (solvent and acrylic), chalks, pastels, washes, inks and powdered pigments. I'd not watched someone weather in G scale before. Mike sanded off some of the logo on this boxcar to make it look faded and them took his pocket knife and dug cuts into the "metal" of the boxcar! The room kept filling up and even wives got into the action! Several members of our operating group were there. Some new modelers, some advanced, but all had learned a thing or two. For years I've not really cared about which type of alcohol that I used. Mike went into detail on which to pick and what they are used for. Handy! The excitement kept building as he showed us different tricks. When he fired up the spray booth, we left our seats for an even better look. The two hour bell rang, and we forced him to keep going, all of us riveted to what he was doing. I'm amazed at how easy he makes it look. The HO scale gondola looked real! My favorite topic was painting a brick building. He showed us a technique for using chalk/pastels and an alcohol ink wash to make mortar in bricks. It was fantastic! It looked better than any of a dozen techniques I've used over the years and I'll try it and post the results on the blog. He rusted the trucks and then weathered the G scale box car. It was so real that I couldn't believe it. Thanks Mike for a great clinic and for sharing your skills. I look forward to the next clinic! To make telephone poles look more realistic, used stained glass paints to reproduce glass insulators on the poles. It is easy to do and is a 100% improvement on out-of-the-box poles. There are two types of weathering; that which collects on the surface, and actual changes in the surface such as rust. For mortar in a brick building, scrape up shavings from a light gray chalk and apply using an ink wash to the plastic brick. Allow to dry and the brick will have a light gray coating. Wipe of the coating and you'll have a very realistic motar finish that is better than acrylic paint techniques. Mortar in bricks is often not much different in color than the brick in older buildings. Remove trucks from rolling stock before weathering, and remove the wheels from the trucks. this allows you to pay special attention to each piece. Then reapply the trucks to the rolling stock before any oversprays. Different trucks weather differently. friction bearing trucks tend to have a greasy black appearance where roller bearing trucks are more rusty. Use fine sandpaper to distress printed logos and test on rolling stock. Tack boards on boxcars weather rapidly and will have cracks and knotholes that should be carefully modeled. Don't use plastic handled brushes with solvent based paints, and don't use plastic cups. Gray scale chalks are handy for weathering in that they can be mixed with paints to provide texture as well as color. Put grimy black on door tracks for boxcars as they were heavily greased and leaked frequently. There are water based india inks which don't work well, and don't mix with alcohol. Be alert to this. When using alcohols note that there are several types. The strength of the alcohol is noted in its percentage (i.e. 97%) which means that it is 3% water and additives. When working with ink washes, use a 50% alcohol base so that you don't wash off the ink (paint) lettering on the car or locomotive. The ink wash mix can vary greatly. A heavy mix would be two-to-three drops of india ink to 4-5 oz of 50% alcohol. There are brown and other color india inks. When buying black be sure to get carbon black as some of the inks have a blue hue to them and don't work well for a black wash.
Use Floquil Earth for a general overspray on a model to help tie together all of the weathering. Spend the time to weather the underside of the car as this will add to the affect. Lane Stewart has posted some great video links! Have a look! I need to finish my A/P Structures Certificate. For years I built models and didn't photograph them, have them judged or saved them. Most were sold. Ok, so I start over. A. 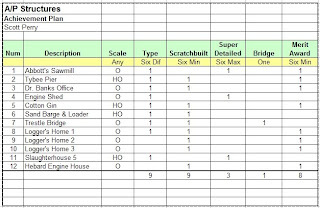 At least six different types of structures must be represented in the total. B. 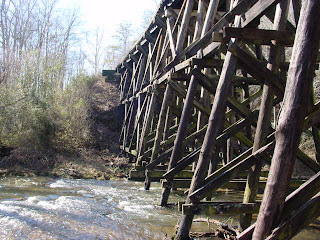 One of the six types must be a bridge or trestle. C. At least six of the models must be scratch built. D. The remaining six, if not scratch built, must be super-detailed with scratch built or commercial parts (for extra points). This really sounds daunting but actually it is more expensive and time consuming than difficult. 1. Abbott's Sawmill: DONE. Won 88 points for a complex kit built in O scale. It is already documented and in the book. I gave it to a friend that needed a mill, but I kept the write up and photographs this time! 3. Dr. Bank's Office: Planned. Scratchbuilt. Small wood structure with detailed interior. O scale for the Swamp. Should earn 87.5 points. 4. Engine Shed. Under Construction. Detailed Kit. Small brick and stone structure with detailed interior. Narrow gauge On30. Stand alone model. 5. Cotton Gin. Planned. Scratchbuilt for contest. Board or metal construction with detailed interior. HO scale. For Dixie Central. 6. Sand Barge & Loader. Not planned. Scratchbuilt for Dixie Central. Will not be judged, but will be highly detailed. 7, Trestle Bridge. Planned. Model of the Turnip Town Trestle on the GNRR in HO scale. For judging. Board by board construction. 8. Logger's Home #1. Planned. Built in same format as Dr. Bank's Office but without dress front. Using pre-cast interior framing and board by board construction. In O scale for Swamp. 9. Logger's Home #2. Planned. Built in same format as Dr. Bank's Office but without dress front. Jim Crow structure, different from #1. Using pre-cast interior framing and board by board construction. In O scale for Swamp. 10. Logger's Home #3. Planned. Built in same format as Dr. Bank's Office but with a different dress front. Designed for Wood's Forman and his wife. Using pre-cast interior framing and board by board construction. In O scale for Swamp. 11. Slaughterhouse #5. Under Construction. Detailed kit with scratchbuilt cattle yard and interior details. HO scale. Model for Paul's layout. 12. Hebard Engine House. Not Planned. On30 engine house for the swamp. Highly detailed. Not prototype located yet. Build for contest/magazine. That's a lot to build. Will be next year before they are all done, but I'm making GREAT progress right now! Maybe I can have most of them ready for judging in November. Dr. Bank's Office and the three logging houses will go very fast as I'll use rapid production and casting techniques. For years I've been using 3rd Plan It. While it is handy, I've spend over $600 now trying to keep up with the latest version. My friends and I are having a helluva time sending drawings to each other because we are all on different versions. That and the software is always a bit buggy. 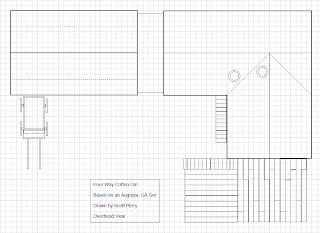 I'm working on a Cotton Gin in HO for my Dixie Central Railroad and I need to draw the structure. 3PI doesn't do plain old drawings very well, so I'm going to switch over the XTrackCAD to give it a try. Lots of people use it. I'm also going to try Google Sketchup since it is free as well and does 3D drawings. Take a Look at Snow! It rarely snows in Georgia. Its even more rare to get more than an inch. So I made sure I took plenty of pictures of the 4" snowstorm. You can see how the snow layers itself on the limbs. I like the harsh shadows of the winter day. This is very hard to model but can be done with careful shading techniques. Bob Wheeler is going to put snow on his layout, so these pictures will help. As you can see the "smooth" snow is really full of texture, from footprints to shrubs. Evergreens like these here droop under the weight of the snow that has collected on the branches. Note there is less snow under the tree, making a kind of "dip" at the base. Man made objects such as the mailbox clearly show the fresh snowfall. Foot prints clearly show the neighborhood children sneaking back to my creek. As the snow melts the areas in the shade will remain for quite a long time. The tree will thaw out first. A closeup of the mailbox shows how much snow we had last night. Cars get coated on all sides, even on top of the tires. The blowing snow sticks to everything vertically and horizontally. These bushes are dripping with snow, but there is none under the plant. Animals like to make tracks as does my Shetland Sheep Dog, who fur has fluffed up due to the cold. He probably feels the calling to his native land. Or the call to nature as my city-fied dog doesn't like to pee in the snow and has been holding it since yesterday. The woods are lovely, dark and deep...stopping by the woods on a snowy evening. I let the sun shine through the lens intentionally to get the brightness and the long shadows. Sorry about the grill. The wood pile and the blue bird box rest quietly under the white blanket. The sky is a solid dark blue. The backyard trees are covered. What's this? An invader! These are WABBIT TWAX! We have a large momma bunny that lives in the back yard and was out and about last night! This was a good chance for me to study snow. For me studying snow means studying shadows.